The human body can store 5-700g carbohydrates in the muscle and 50-100g in the liver but can’t store protein and we don’t want to store fat. You probably saying now. “but carbs make you fat” well this can be true and not ,why? Carbohydrates causing insulin secretion in the body. Originally this insulin is designed to trigger the body cells to use ,also muscles and the liver to store it as glycogen ,this is called carb loading. Insulin don’t make you fat! then when we fast eg. sleeping or between meals the body releases glucagon to use the stored carbohydrates ,this balance keep the brain and organs always fed with enough glucose. Glucose is the no.1 source of energy for every cell in the body! Fat is only used in emergency or starvation! Low-carb diet benefits are always short term ,causing cravings and extra stress. 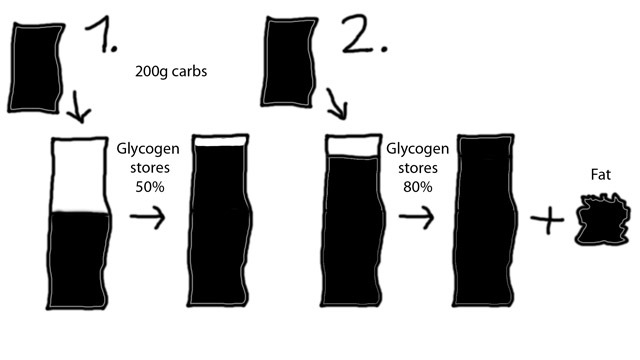 So the most important thing in high carb diet to keep the glycogen stores always under 60% to avoid overfilling. – Resistant training or any form of high intensity exercise. more carbs you want to eat, lower the glycogen stores must be. eg. after 16 hours fasting ,even 3-400g carbs won’t cause any form of fat gain. If the exercise is very hard eg. weight training ,power lifting ,your glycogen never go over 60% because the constant energy use for muscle repair. in this case carbs are important any time of the day ,even 1-2hours before bedtime. how do you know when you overfill? Is there any sign? How can you loose weight?